Medi-Hooff’s | Stephen Health Agency Inc.
Calendar year ’04 Stephen Health Agency Inc. introduced it’s third product this time in the large mammal category. 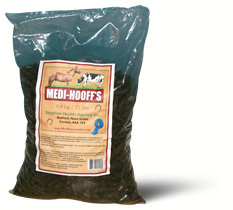 Medi-Hooff’s™ for cattle and horses. Medi-Hooff’s™ is a high-quality edestin protein, meaning a complete vegan source of clean protein. Medi-Hooff’s™ contains more available protein as a percentage of weight then any other food source with the exception of Soya. Soya contains equivalent amounts by weight but is not recommended for supplementation purposes due to problems with digestibility, potential thyroid and hormonal complications. THC Content: Cannabis seed stock used in Stephen Health Agency products contain allowable trace amounts of THC, less than 5 ppm. Medi-Hooff’s™ product being approximately 70% dry matter contains substantially reduced levels and consistently tests at barely detectable. Packaging: Product is packaged in a 6.8Kg/15 lbs clear plastic bag. DIRECTIONS: 4 ounces per day based on average size (approx. 1000 lbs), mixed with feed or as a snack. For rapid weight gain, as required up to 12 ounces per day.